I keep a list of things that I want to accomplish in life. I thought that the older I become, the smaller the list would get. In fact, it is the opposite. The list of places I want to visit grows larger each year. The more aware I become of this big beautiful world. the more I want to see. For instance, last month I found this hotel in Kenya where you can stay with Giraffes. I mean, seriously. There are still a few things that remain on my list from my late teen years: get a tattoo, get really mad and throw a glass at the wall, buy a VW bus and drive across North America. I've attempted to get a tattoo, twice, but each time I back out at the last second. I think that pretty soon I am going to have to either commit or let that one go. Throwing the glass at a wall is bound to happen sooner or later, and maybe one day, when Brent and I are old and wrinkly, we will buy a bus and drive across North America, and then I'll eventually get really pissed (because that's a lot of time to spend with someone in a small confined space), and I'll throw a glass at the wall. Another thing high on my list, since way way long ago during my granola crunching hippy days, sitting around in my pajamas (because that's what I wore) listening to Bob Dylan and The Grateful Dead , is growing a fruit tree, or two, or three. This fruit tree obsession lands somewhere on the life-accomplishment to-do-list just before owning a vineyard, but after the giraffe hotel. But apparently these days, you need to have some celebrity status to tap into the vineyard business, so maybe I'll just plant a few grape vines in the backyard and start making wine in my basement. In all serious though, I am going to start brewing beer in the fall, and it is going to be insanely awesome. A few weeks ago Brent and I were driving home from a wedding, on a beautiful Sunday afternoon. With a few hours to kill before picking the dog up from daycare, we stopped into this crazy big nursery just outside of Seattle. It was 15 acres full of big beautiful plants. I bought as many as I could fit into the trunk, while still leaving enough room in the back seat for the dog. Within the selection of perennials that I had chosen, I finally bought my very first fruit tree! It isn't a lemon tree like I had envisioned, but it is a dwarf mandarin tree and I am in love with it so much. It has a few baby mandarin growing now, and I am hopefully that they will reach a large enough size that I can enjoy. I have heard that citrus trees are can be pretty difficult to grow indoors, and especially in the Pacific Northwest with the lack of sunshine. But at this point, I am excited and ready to give it a grow. Inspired by my baby mandarin tree, I wanted to make something sweet and citrusy. Four years ago, I moved to Seattle, and four years ago I was introduced to Uncle Seth's Original Pink Cookie (here is a pretty great story, to sum up, these cookies). They are one of those super fun and tasty cookies that makes you all happy and giddy inside. Like you are 4 years old and someone just handed you a PINK COOKIE! If you are trying to find these cookies, you will need to visit Seattle or Provo, or I can send you one if you want. I can't seem to find much info on them, just that they mysteriously pop up in various shops around the city, and then vanish. I decided to make a version of my own cookie so that I'll have a recipe handy when those pink sugar cookie cravings hit, and my cookie chance won't need to rest in the hands of fate. These cookies are soft and delicate. Sweet and tart. They are so perfect for the summertime. Light and refreshing. 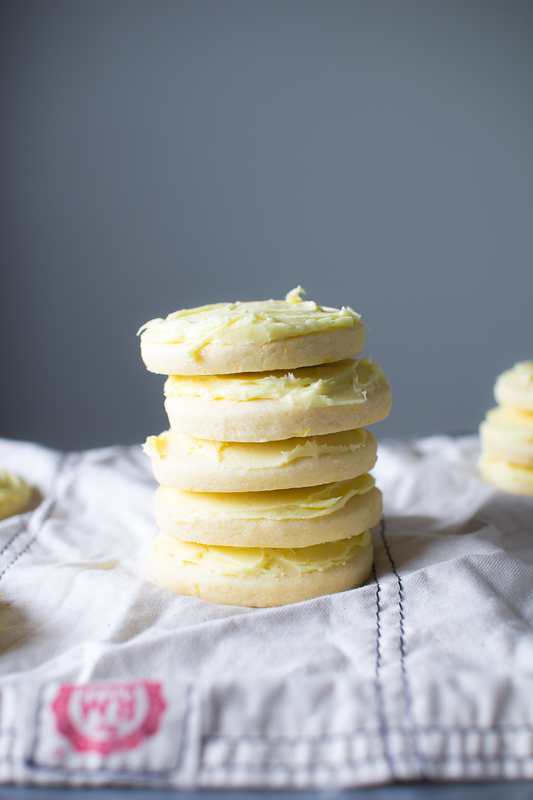 Like a big glass of lemonade in cookie-form. The buttercream frosting hardens and then you are able to store them in a container, one on top of the other. Let's embrace the inner 4 years old in ourselves. In a medium bowl, with a hand mixer, cream the butter and sugar together until light and fluffy. Add the egg and beat until combined. Zest the lemon and then squeeze. Add 1 tbsp lemon juice, lemon zest, and vanilla to the bowl and stir. Gradually stir the dry ingredients into the wet. Cover the bowl with plastic wrap and place in the fridge for one hour. Sprinkle some flour onto the counter and coat the rolling pin. Roll out the dough a little thicker than a 1/4 inch. With a 3 - 4 inch round cookie cutter, cut out the cookies and place them onto the parchment lined baking sheet. Bake for 10 minute, until soft and golden on the bottom. Transfer to a wire rack and let cool before frosting. Beat the butter, powdered sugar, 1 tbsp lemon juice, zest from 1 small lemon, and vanilla until light and fluffy. Mix in a few drops of yellow food coloring until you get the desired light yellow color. Once the cookies are cool, cover with frosting. The frosting will harden up within a half and hour, and then you can place them in an air tight container to store for a few weeks in the fridge.